We’re headed to US Botanic Garden this weekend for their Junior Botanist Festival Saturday Sept. 26, 10 am-3 pm. Come join us for demos using vanilla beans. The Garden has a vanilla orchid as part of its collection, so you can see how the bean grows in real time. Vanilla-poached pears are a fall fave. Adrienne will be demoing this. Danielle is working up an apple-vanilla concoction and we’ll post it as soon as it’s perfected. Come taste something delicious Saturday at 100 Maryland Ave SW. The Pope will be long gone. Remove the cinnamon, bay leaves and vanilla bean from the wine mixture. Continue to simmer and reduce the liquid until thick and syrupy, about five minutes. Be sure not to over-reduce or burn the syrup. Whisk in butter, quickly, one tablespoon at a time. Cover sauce and remove from heat; hold until ready to serve. Combine in a small bowl the mascarpone cheese, heavy cream, pinch cinnamon, vanilla extract and powdered sugar until smooth. To serve, place a small dollop of the Mascarpone Cream on a dessert dish. Place a poached pear half on top of the dollop, which keeps it from sliding. Fill the “bowl” of the pear with mascarpone cream. 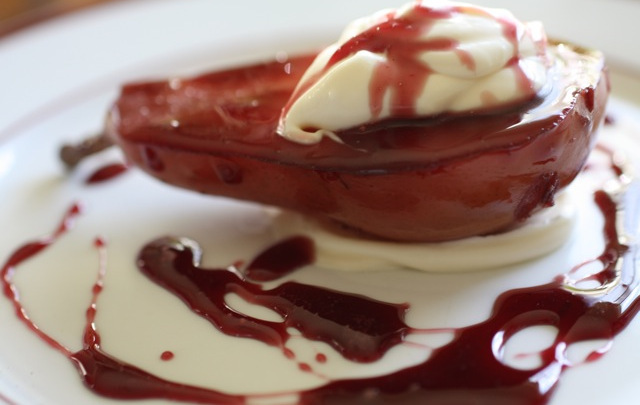 Spoon or drizzle pear with red wine syrup. Repeat with remaining pears. Many thanks to Rachel Reuben, FoodFixKitchen.com for original recipe. This entry was posted in Desserts, Gluten Free, Recipes from Adrienne's pantry and tagged pears, vanilla bean, wine. Bookmark the permalink.